We are the Role-Players Guild of Kansas City (RPGKC), a 501(c)(7) nonprofit tabletop hobby gaming advocacy organization dedicated to enhancing gaming in Kansas City and the surrounding areas since 1990. One of the largest game clubs in the midwest, we maintain relations with many game companies, industry luminaries, local game shops, and Midwest gaming groups. We play mainly role-playing games and board games, along with some miniatures, card games and live-action role-playing games (LARPs). Our members play at Guild-hosted events and often arrange their own game sessions. The majority of our members reside in the Kansas City metro area, with some located across the nation. New players welcome! Membership dues support the organization's conventions, outreach efforts, operating costs, and allows us the occasional box of staples. We enjoy an all-volunteer staff of officers and committee members that are dedicated to educating the public about tabletop hobby gaming and bringing gamers together. We host games, Game Days and gaming conventions, including ShaunCon, our annual gaming convention, running every year since 1990. Part of the Midwest GameFest, ShaunCon is four days of RPGs, board games, miniatures, card games and other events each November. Check out our list of local and regional events. and our list of local and regional store and conventions. Game Days occur the second Saturday of each month at various Kansas City area game stores. Check the Game Day section for each month's location! Play sessions typically start at 10am, 2pm and 6pm. Drop in and play all day! Game Days feature roleplaying games and board games mostly on an ad-hoc basis. Signups are encouraged but not required, and organization of play is loose. Check out our Warhorn page for event listings. Monthly Guild business meetings are held online the first Tuesday of each month at 7:00pm. The online venue may vary, so check our Business Meetings page, Calendar and Facebook events for details each month. All members are welcome to attend, as well as those interested in learning more about the Guild. Remember that only members in good standing may vote on Guild matters. Check out our bylaws for details on voting. To join the discussion about Guild events, join our Facebook group, Meetup Group, or Twitter feed. All are open to members and non-members. And don't forget to subscribe to our monthly(-ish) email newsletter highlihght the upcoming month's events. Get involved! The easiest way to try out the Guild is to attend one of the monthly Game Days. Play a game or just attend our short business meeting. You can also get more information via our Facebook group, Meetup group or Twitter feed. Dues are cheap, and paid members get benefits like discounts at area conventions. For a listing of current officers and the positions they hold within the RPGKC, check out the Officers page. The Role-Players Guild of Kansas City, Ltd. is a nonprofit group of role-playing game enthusiasts dedicated to bringing quality gaming to all and educating the public about that gaming. All contents of this website are copyright by the Role-Players Guild of Kansas City, Ltd.; all rights reserved. Contents may not be reprinted without the consent of the Guild and the individual author(s). GenCon, and D&D are trademarks owned by Wizards of the Coast, Inc. Other items, events, and subjects used herein may be copyright and/or trademarked by their respective companies. Their use is by organizational association only, and are used in a not-for-profit manner. This use should not be construed as a challenge to such status. 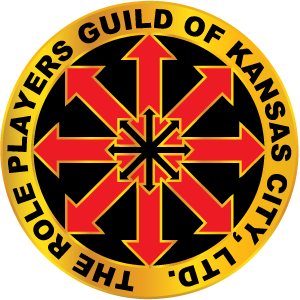 For more information about the Role-Players Guild of Kansas City, Ltd., shoot us a note or follow us online.